Mass. 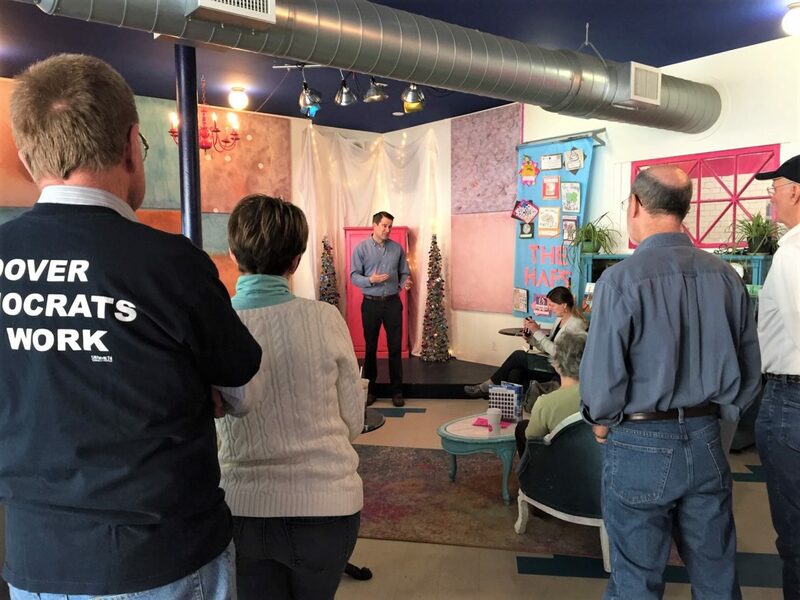 Rep. Seth Moulton at the Teetotalers Cafe in Somersworth, New Hampshire on Saturday, March 16, 2019. Editor’s Note: Susan Dromey Heeter will take an occasional break from her column Joyful Musings to tell it like it really is as the first-in-the-nation primary parade of candidates ramps up in her new political column Decoding the Vibe. Three is a lovely number. I have three brothers. The triangle has three sides. There are Three Stooges and let’s face it, three is cool. So, in the spirit of three, after I attend three visits by presidential candidates here in the granite state, I’ll write a behind-the-scenes look at their visits. Decoding the vibe. I’ll muse joyfully on what I have seen, observed, laughed at. And while I hope to cover some political angles, my intent is to invite you, dear reader, to join me before the rhetoric begins, before the backs straighten, the lights go on. I want you to come with me behind the scenes, watch the mic checks, meet the people who go visit presidential candidates. Last Friday I attended Mass. 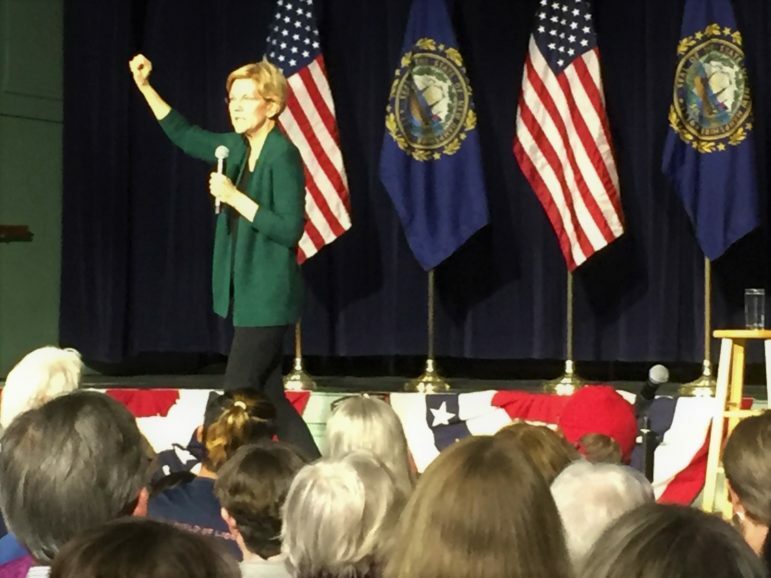 Sen. Elizabeth Warren’s visit to Exeter’s Town Hall. Full disclosure, I like Liz, she’s exceedingly down to earth and I admire that she wears pretty much the same thing to every event. Last week it was black pants and a scoop neck shirt – very utilitarian, very comfortable. She arrived with her husband and yellow lab, both of whom sat in the front row. I was in the back with the other reporters, one from London, another from Germany. I felt very international, grateful that I am fluent in both British English as well as passable auf Deutsch. We talked of the current political climate and I realized how lucky I am to have only driven about 20 minutes to attend this event. I walked around and learned the music playing was orchestrated by the Warren team; unfortunate though it was to hear Michael Jackson, I still get pumped by his music. I like chatting with the workers, the volunteers. Like the make-up artists and the stage directors, they’ve got the real behind the scenes view which, let’s face it, can be far more interesting. Seth Moulton is a congressman from Massachusetts who has not officially put his hat in the ring, but who spoke at the Teetotalers Cafe in Somersworth last Saturday. His assistant arrived early; it’s easy to spot those affiliated with political campaigns as the waxed jackets and distinctive leather footwear is a dead giveaway. No offense, New Hampshire, but men’s fashion is not the strong suit here; I give my husband’s worn out Merrell’s and LL Bean jacket as evidence. Yesterday, my friend, John O’Mahoney (Hi, Johnny O!) 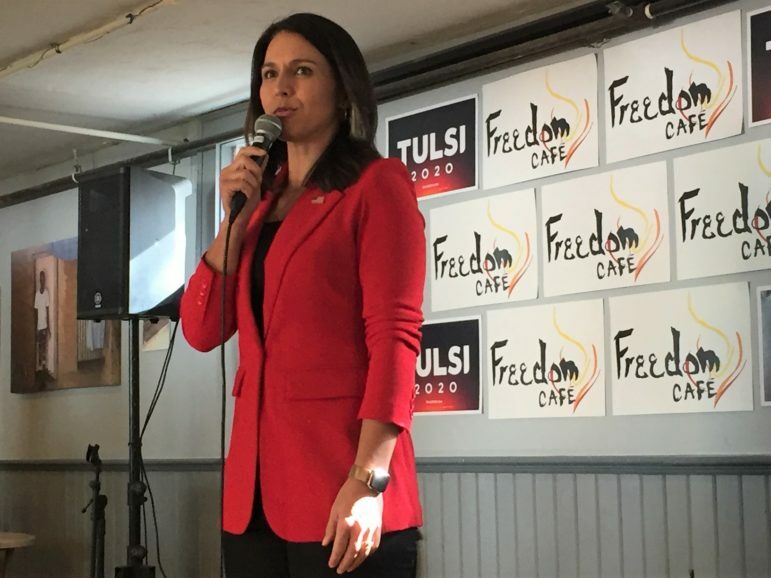 and I attended Tulsi Gabbard’s Meet and Greet in Durham. Sponsored by the Young People’s Coalition and held in the Freedom Cafe, this was a really comfortable venue by which to listen to another politician; we scored a front row couch. Again, the assistant was wearing the distinctive leather footwear, jeans and a waxed jacket. I watched as he took down all of the posters after the event and as he corralled Gabbard to her next venue I saw the distinct correlation between assistants and border collies. Gabbard is stoic and she referred to being president as being “Commander in Chief” several times. She responded to questions about climate catastrophe, Palestinian/Israeli conflicts with confidence, with serious commitment. The vibe of the event was less “cowabunga dude” and far more “Be afraid, be very afraid.” I left feeling far more alarmed than I would have liked; it was challenging to muse joyfully after listening to Gabbard – even though leis were plentiful. Yikes. So, dear readers, dear Joyful Musers, I thank you for coming along with me on these initial visits. I’ll continue to write of the next three and invite you to join in any candidate visits if you are in the 603. We can decode the vibe together, ask some good questions, drink some tea. Be well, enjoy the ride and if you are wearing fabulous leather shoes and a waxed jacket, good luck corralling those crowds.